Most people know it under the name of hypoglycemia. Low blood sugar happens as a result of not getting enough calories when you need them. Conversely, it often occurs when eating too much sugar (or high glycemic foods) which causes a rapid blood glucose spike and then a quick drop. The latter is especially troubling for carbohydrate sensitive individuals, which I will explain further in this post. How much sugar do we eat per capita? 150. That’s the number of pounds of sugar that we consume every year, per person! About 30 pounds comes from direct sugar intake, the rest we get from foods that have sugar added such as candy, sodas and much of the junk food for sale. Often I think that this number must be too high, but many people regularly consume lots of soda, junk foods, ice cream and such so it is probably an accurate statistic. Hidden forms of sugar are also found in ketchup, yogurt, peanut butter, canned vegetables and fruits and commercial breakfast cereals for example. If the label doesn’t say ‘sugar’ outright, you need to watch for listed items like ‘high fructose corn syrup.’ Low fat products often contain more sugar to make up for the loss of the taste of less fat content much to the consternation of dieters and the probable main reason people gain weight when they avoid fat. 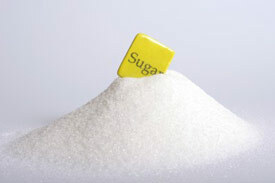 Manufactured sugar causes cravings that rival a coke addict in many people. That’s the reaction junk food manufacturers are looking for. Eat one, eat two – can’t stop – eat the whole bag. That’s the pattern that often happens, especially when you aren’t even hungry. Sugar is contributing to 35 million deaths worldwide each year due to obesity and diseases like diabetes, heart disease and cancer (women with the highest blood sugar levels were found to have a 26 percent higher risk of developing cancer than those with the lowest, whereas women with the highest processed carbohydrate intake — 62 percent of their diet or more — were more than twice as likely to develop breast cancer than those with a lower carb intake — 52 percent or less). Excess sugar is linked to changes in metabolism, increased blood pressure, liver damage and interference with hormone signaling. Consuming too much sugar suppresses immune system cells responsible for attacking bacteria. Even consuming just 75 to 100 grams of a sugar solution (about the same as in two 12-ounce sodas) reduces the ability of white blood cells to overpower and destroy bacteria. This effect is seen for at least a few hours after consuming a sugary drink. Studies have shown that greatly reducing intake of sugars and caffeine can directly lower alcohol cravings. Sugar taken every day produces a continuously over-acid condition, and more and more minerals are required from deep in the body in the attempt to rectify the imbalance. Sugar is a major factor in dental decay. Overeating, poor memory formation, learning disorders, depression – all have been linked in recent research to the over-consumption of sugar. Long term ingestion of sugar contributes to fungal/yeast infections in the body including candida overgrowth. Processed sugars are a pro-inflammatory food. Out of control inflammation may be the cause of many killing diseases we suffer from today. Some people (like myself) are carbohydrate sensitive. That means if we eat too much sugar even in the form of natural sugars like mango, papaya and banana we can experience a quick rush of energy followed by a crash where we can feel tired and lethargic. But it is processed carbs that cause the symptoms to be more intense like pizza, pasta, rice cakes and such – those foods known as high glycemic – they break down quickly in the body and release a high amount of sugar at once. A lot of insulin is released to counteract and lower the sugar spike, which then often results in hypoglycemia. For people with a propensity to gain weight, the sugar is stored (facilitated by insulin) into the fat cells. The reason: too much sugar in the blood all at once has to be safely dealt with and the fat cells are more than happy to help out. They store the excess sugar as fat. Glucose (blood sugar) can be stored in the muscle and liver as glycogen, but only a very small amount can be stored there. Not good news. That’s why folks who are carb sensitive with weight issues (not me) can eat within the calorie range for their body type and still gain weight if they eat too many high glycemic foods all at once. So pizza for dinner, cake for dessert and popcorn while watching an evening movie really causes health damage over time, especially with little or no exercise. Does the Type of Sugar Matter? White versus brown? Raw versus refined? Organic or not? When it comes to sugar, there are a lot of options but choosing raw or organic sugar will not negate its health risks (with the exception of perhaps lowering pesticide and chemical exposure for organic brands). There are some slight differences – for instance unrefined raw sugar is made from the juice of the sugar cane plant, and as it is not fully refined, it will have trace minerals and nutrients, although not in any significant amounts – but they are negligible in terms of your health. We use agave in small amounts when we require a sweeter and Marian uses stevia too (I don’t like the after taste myself). Sugar substitutes can still cause some people to crave real sugar. After all, the brain registers the sweet taste as ‘sugar’ and cries out for more in many instances. If you are addicted to refined carbohydrates, you must abstain from white sugar and white flour products for at least 14 days. Stay away from tropical fruits too. That means you must follow a healthy detox program of veggies, salads, veggie soups, low sugar fruits like berries, cherries and apples (all northern grown fruits). If you can add a fresh pressed green veggie juice daily, that would be a bonus. You can add small amounts of wild-caught fish and organic chicekn 3-4 times a week. Drink plenty of water too. Once you have detoxed from the sugar, avoid white flour and white sugar and instead enjoy whole grains, low sugar fruits, added stevia or agave. Too many processed carbs are a poison over years of consuming them — they are killers! Avoid them or at least cut back whenever possible. If you start to experience sugar cravings or suffer from the symptoms of carb sensitivity again (feeling tired immediately after eating them, having an episode of unclear thinking — ‘foggy brain’: feeling moody or irritable — gaining weight after a few weeks of having too many) avoid them and detox for a few days. You will begin to know when and how much you can have of carbohydrates as you experiment for a few months. What are your thoughts? What has been your experience with sugar? Ever think you are addicted? Did you ever have to overcome cravings? All comments are welcome. We don’t bite.